Carla Thomas in an American soul singer. 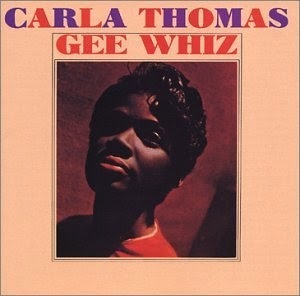 Carla Thomas was born in Memphis in 1942, the daughter of R&B singer Rufus Thomas. Growing up in a musical family, in 1952 she became an underaged member of the Teen Town Singers, a group of high school students sponsored by the local WDIA radio station, and she sang with them all through her high school years. Her break came with some help from her father in 1960, with whom she recorded the R&B duet "Cause I Love You", which was released on a new Memphis label named Satellite Records. The song became a regional hit, and got the attention of Jerry Wexler of Atlantic Records, who signed a deal with Satellite to have the single distributed through Atlantic. Before long Satellite had been renamed Stax. Later the same year Carla recorded her first solo single, a teen-pop ditty she had written when she was 15. With Atlantic's assistance, "Gee Whiz (Look At His Eyes)" reached not only #5 on the national R&B chart but #10 on the Billboard Hot 100 in early 1961. It became Stax's first national hit, and launched Carla's recording career, putting her in the spotlight as she got to perform the song on American Bandstand. An album's worth of material was quickly put together, all in the same string-laden pop style of the single. It was a far cry from the hard soul sound Stax would later be known for, and the sound of the album has not aged well, but this was just the beginning, for both Carla and Stax. The album did generate another hit, "A Love Of My Own" getting to #20 on the R&B chart.